I am so excited! I found out about this Kombucha ''Mushroom'' around a month ago - and I am still all happy about finding this amazing Traditional Chinese Medicine drink. It looks like mushroom, but it is not. Since yeast is pretty much present all the time and yeast are technically fungi, it is easy to mix it with mushroom. However, it is not mycelia (what usually mushrooms are - it is a kind of lichen. Don't mind me if I'll be using 'Mushroom' or 'Culture' or Kombu-Tea expressions from time to time - it is all about the same thing. Before I start complicating everything let me tell you my story about it and short story about what have I found out about it so far. A month ago my girlfriend's friend gave us this marmelade jar with a mushroom inside and some liquid which we should use when start breeding our new baby. At the same time he was telling us a 100-year old story about Korean lady, who came to Russian village with all the people being really old (like 100 years, even up to 130 years old) and there was this funny story about one 130-years old grampa being married to 80-years old lady. Korean lady was amazed and could not understand how this was possible and villagers explained her that they had been drinking Kombu-tea for many years. They gave her the mushroom present and that is how russians got this eternal-life-drink and from there it travelled around the world. At least this is how I have been told the story. Check history and the legend of kombucha chapters and find out what 'really' happened (at least on of many possible stories). Folk medicines, herbal remedies and dietary supplements, also Kombucha tea, are not considered foods or drugs, this is why they are not routinely evaluated by the U.S. Department of Agriculture or the U.S. Food and Drug Administration (FDA). According to the U.S. Centers for Disease Control and Prevention (CDC), drinking this tea in quantities typically consumed (approximately 100-200ml or 4-8 oz daily) may not cause adverse effects in healthy persons; however, the potential health risks are unknown for those with preexisting health problems or those who drink excessive quantities of the tea - proceed with caution. Boiling the water. Use fresh water with no or not much of chlorine, if possible use water which does not contain too much limescale (so called soft water) - best are distilled or filtered water. 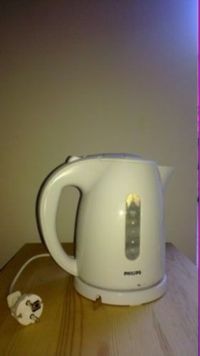 I use my electric water heater for water boiling because it is much faster than boiling it on the stove. Wait for 10 - 15 minutes, which is longer than usual when you making your favourite tea, but remember - this time you are not making it for yourself but for your Mushroom. the reason why you should wait longer is because longer you leave tea in hot water, more nitrogen will be released. Nitrogen released from tea is this Culture's food! 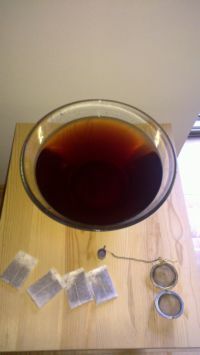 Remove tea bags or filter your tea and add sugar. You should add app. 100 grams of sugar per 1 Liter of tea. You can add less sugar if you want your tea to be more sour, or simply brew it another day or two and you should get same effect as your culture will eat more sugar. And remember - you should use white sugar, no brown or other kind of fancy healthy sugar is good for your mushroom. Wash your hands! Do not use soap! I use bicarbonate of soda. 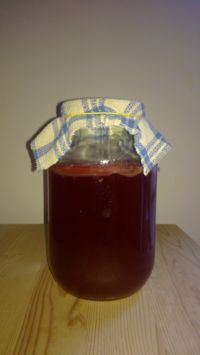 Tea should be at the room temperature (20 C to 30 C) and the minimum temperature for Kombucha to survive and brew tea is 12 C. Take your Kombucha Mushroom and gently wash it with water (room temperature). 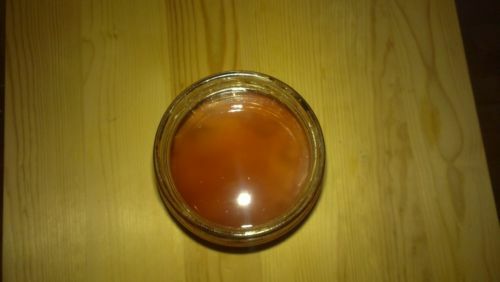 Pour tea into an empty jar, add some Kombu-Tea (1 inch or so) and than add mushroom culture. Cover it with an old cloth and let it rest for 8-12 days. At the above picture you can see new baby mushroom in a jar from a bird prospective and on the right baby mushroom struggling to stay at the surface. If your culture sinks - don't worry. Leave it over the night and if it won't come up, you should help her with a wooden stick. Mushroom has to be at the surface as it needs to get some fresh air. After 8-12 days, depending on your taste (sweet or sour), your Kombu-tea is ready. Well, the easiest way to get the mushroom culture is to ask one of your friends/colleagues/relatives/neighbours if they are breewing it. Also you can find many places on-line selling packed Scoby, but these are rather expensive. 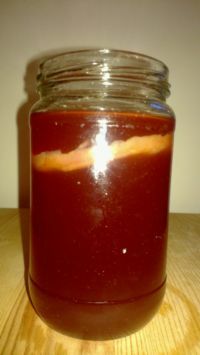 At this point I should advise you not to buy dried Scoby - stick to the ones selling a Scoby together with some liquid. On the other hand I have around 10 Mushrooms already - and the number will grow every 8-12 days and I would be happy to provide you with your starter mushroom. It is only a matter of packaging & shipping. I'll think of something. Again, I was and still am amazed. I have been drinking Kombu-tea for around a month now and I can tell you that I feel great. When I tried it for the first time - it was actually a little bit of tea which I got with a Scoby from a friend I was quite suprised by the taste. 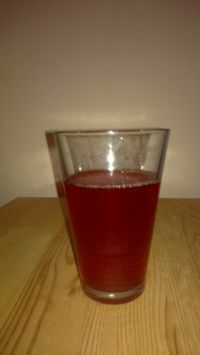 Sour, fizzy, refreshing and my face went like when you drink a really strong lemonade. You can actually regulate sweetness or sourness depending on how long you will breed Kombucha. the shorter the breewing process, the sweeter the Tea, because some sugar will remain in your drink. Give Kombucha to your Friends!